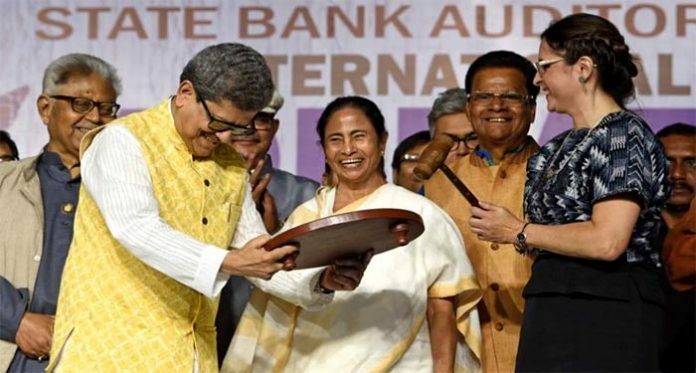 Chief Minister Mamata Banerjee and Guatemalan author Euda Morales (right) at the inauguration of Kolkata Book Fair 2019. On Thursday. Kolkata: The 43rd edition of Kolkata Book Fair opened its curtains today by a day’s delay than the original schedule. 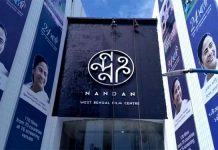 The delay is because Chief Minister Mamata Banerjee, the inaugurator of the Book Fair, was unable to spare time for the previous schedule. The Publishers and Booksellers Guild, however, has not officially cited a reason for the delay. The Guild, issuing a Press release on 28 November, had stated that the Fair will be inaugurated on 30 January and will conclude on 10 February. The release is still available on its website. 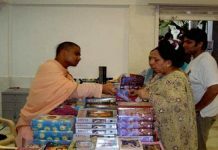 But in two subsequent Press releases issued on Delhi and Kolkata datelines on 9 January and 21 January, respectively, Guild said that the Fair will start on 31 January and continue till 11 February. It did not cite a reason for tweaking the schedule. 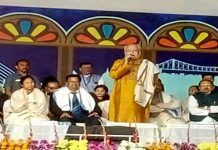 Going by the new schedule, the Chief Minister inaugurated the Kolkata Book Fair at Salt Lake Central Park today afternoon. She was joined by Euda Morales, an eminent author from Guatemala, which is the theme country of the Fair this time. Seven new books penned by Banerjee were also unveiled from the inauguration dais. With this, the number of books written by the Chief Minister has touched 87. “It is no exaggeration if I say that Kolkata Book Fair is the best book fair in the world. This is nothing short of a festival,” she said. As many as 600 bookstalls have been set up in this edition of the Book Fair. Some 20 countries are participating showcasing their literature and publications. The state-owned transport corporations will be operating 190 special bus services to ferry book lovers to Central Park from Howrah railway station, Shyambazar, Sealdah railway station, Ultadanga, Garia and, Behala. The organisers this time have announced a ‘Buy Books and Win a Library’ lottery, wherein four lucky winners will get Rs 1-lakh worth books of their choice and a designer bookshelf for their homes. The Book Fair is open to visitors from 12 noon to 8 pm every day until 11 February.